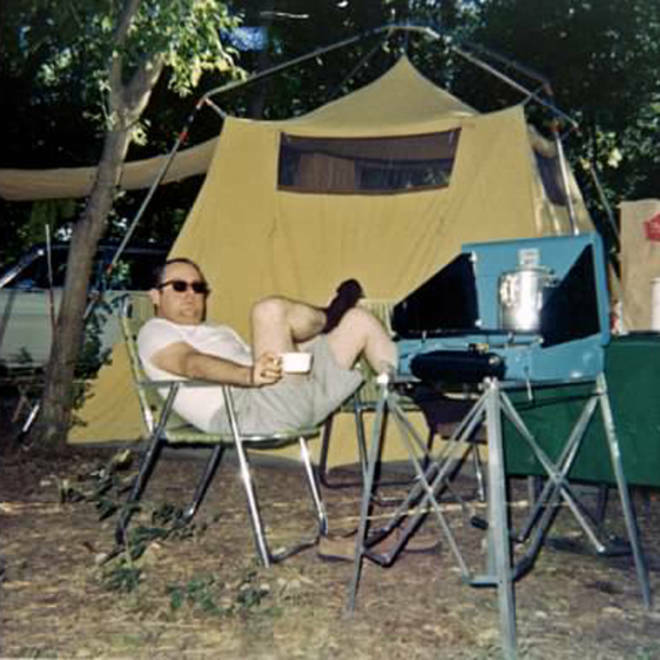 Harry Stamps rests at a campsite at Indian Creek, a campground in North Carolina, in the 1970s. A Mississippi man who only sported T-shirts designed by "fashion house Fruit of the Loom" and had a penchant for buttermilk served in martini glasses is bringing thousands of people joy in his afterlife, thanks to an obituary written by his daughter. Eighty-year-old Harry Weathersby Stamps of Long Beach, Miss., died on Saturday, but his quirky qualities — being a member of a bacon-of-the-month club, outsmarting squirrels — were just starting to take on a life of their own when his daughter, Amanda Stamps Lewis, published his obituary in Mississippi's SunHerald.com. Harry Stamps "particularly hated Day Light Saving Time, which he referred to as The Devil's Time. It is not lost on his family that he died the very day that he would have had to spring his clock forward. This can only be viewed as his final protest," the obituary read. He also detested "eating grape leaves, 'Law and Order' (all franchises), cats, and Martha Stewart. In reverse order." But he had many loves, too. He loved women, particularly smart women, including his "main squeeze," wife Ann, to whom he was married for 48 years. And no one has been more shocked by the thousands of pageviews, Facebook shares, and tweets that her husband's obituary has generated than Stamps' main squeeze. "I am still in a state of stupor over all this attention!" said Ann Stamps, 73, who speaks with a southern accent and ends most sentences with "my dear." "In a few days, all of this is going to be over, and I think I'm going to really, really hit bottom." Ann and Harry Stamps met when they were both teachers at Pascagoula High School in Mississippi. They shared a love for life on the Mississippi coast; they raised two daughters in Long Beach, Miss., and Harry spent most of his career teaching government and sociology at Gulf Coast Community College. Harry underwent bypass surgery in 2004 and the couple lost their home to Hurricane Katrina in the 2005 storm. They had to rebuild, which was a turning point in Harry's health, Ann said. 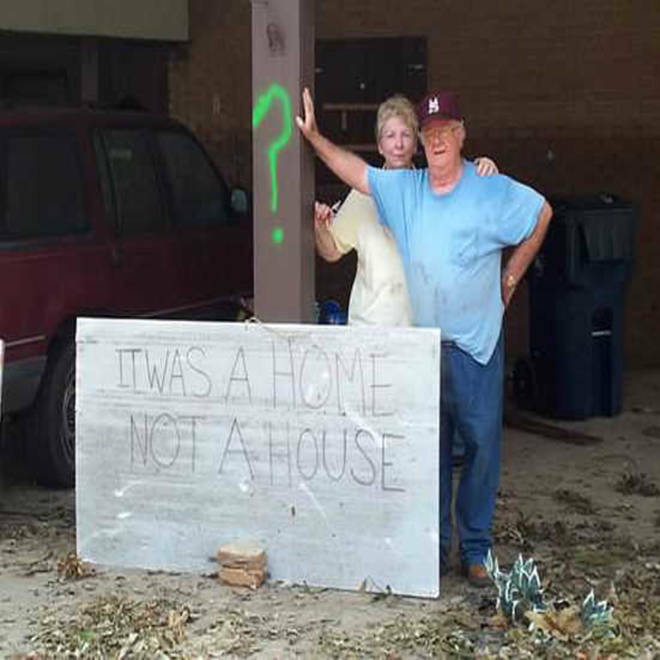 Harry Stamps and his wife, Ann, lost their home in Long Beach, Miss., to Hurricane Katrina. In this photo outside their damaged home, Harry wears his signature Fruit of the Loom T-shirt and grass-stained Mississippi State University baseball cap. "Harry had been sick for quite some time. A week or so ago, I sat down and wrote down some facts and I emailed it to both of the girls, and I said, I think I can do this better now than I can later," Ann said. "And I immediately got an email back from [my daughter] Amanda and she said, 'I will take care of the obituary.'" In the last three years, he needed kidney dialysis. Still, Ann said she wasn't prepared by the obituary her daughter Amanda, who is not a professional writer but an attorney. "That morning that Harry died, she got up and got on the computer and then she came to me said, 'Mama, please let me do this, it's real important.' And she said, 'I know it's not your style, I know it's not what you would have written, but it's important to me.' Well, I started reading it and I thought, there is no way in the world." But as she continued to read the obituary Amanda crafted, infused with details about Harry's "life-long love affair with deviled eggs" and "sausages on saltines," his adoration for using his "oversized 'old man' remote control" to "flip between watching The Barefoot Contessa and anything on The History Channel," his insistence on taking "fashion cues from no one" and the demand that in his honor, "you write your Congressman and ask for the repeal of Day Light Saving Time," Ann had a change of heart. 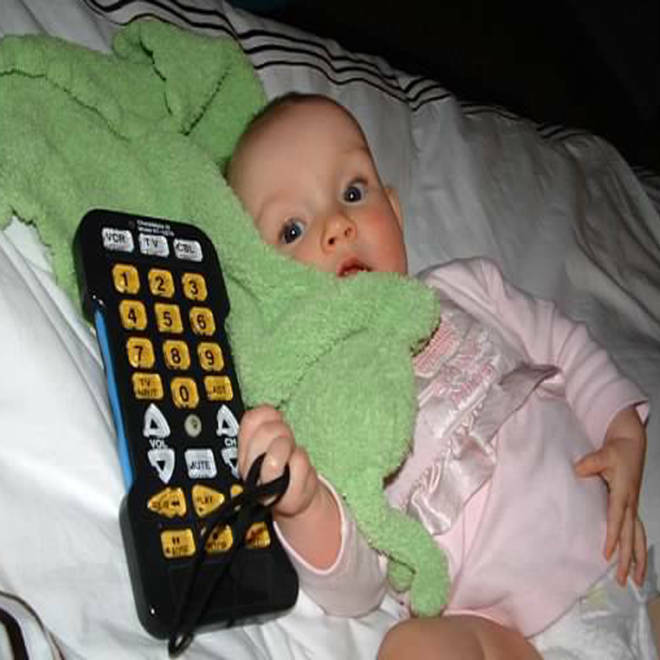 Harry Stamps' daughter, Amanda Lewis, said none of her friends believed her when she'd describe her Daddy's huge "old man remote control." She decided to take a photo of it next to her baby girl, Harper, "for scale." "The remote was one of his prized possessions that survived Katrina," Lewis said. "He was very worried that they no longer made those." "Allison, our other daughter, said, 'The thing about it is every word is true.' And Amanda told me, 'Now Mama, when you're gone, we won't have this kind of material. You're boring!'" Ann said, laughing. "He was one of the most unpretentious people that could ever be. And he was a smart, smart man. And he had wit, and he was quick. And as he got sicker and sicker, we lost that, and that was one of the saddest things." The family is living up to a promise it made in the obituary — "Because of his irrational fear that his family would throw him a golf-themed funeral despite his hatred for the sport, his family will hold a private, family only service free of any type of 'theme'" — and celebrated his life this afternoon in a small ceremony under a sunny Mississippi blue sky. "There's a beautiful bridge that crosses the Bay of St. Louis. And that's where we're taking his ashes," Ann said before the family went to commemorate Harry. "It is gorgeous." However, the family did hold open visiting hours for Stamps. "We had students from '58 and '59 that he taught in high school that came to that visitation and talked about how he influenced them," Ann said. "That's what would have pleased him most. He would not have understood all this other" tweeting and Facebooking of his obituary. TODAY.com writer and editor Laura T. Coffey contributed to this report. From the archives: Man writes his own obituary, comes clean about not really having Ph.D.